Soulages also is known as "the painter of black" because of his interest in the colour, "...both a colour and a non-colour. When light is reflected on black, it transforms and transmutes it. It opens up a mental field all of its own". He sees light as a matter to work with; striations of the black surface of his paintings enable him to make the light reflect, allowing the black to come out from darkness and into brightness, thereby becoming a luminous colour. 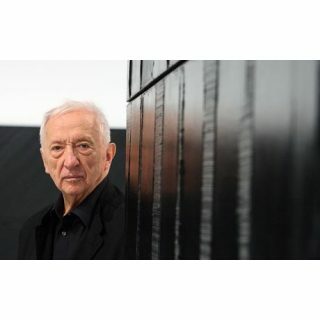 In 1941 Soulages was drafted into the army and was stationed in Montpellier, where he attended the Ecole de Beaux-Arts. There he became aquainted with the abstract artists Sonia Delaunay. He maintians a studio in Courbevoie near Paris and establishes contact with artists such as Domela, Picabia, Bartung, and Leger. In Paris he designs several stage sets between 1949 and 1952 along with trips to Mexico and the USA. 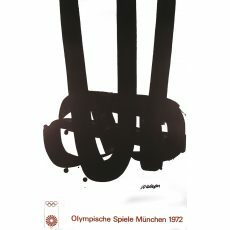 His frist great retrospective takes place in Hanover, Essen and The Haag as early as 1960/61. In the years to follow he receives numerous international art awards, including the "Rembrandt Award" in Germany in 1976. He also wont the "Great National Award for Painting" in Paris in 1987. He was honored in Japan in 1994 with the "Premium Imperiale" for painting and the execution of the 104 stained-glass windows for Conques Abbey which he had begun designing in 1987 and were finally completed in 1994. In 1997 an important retrospective of his complete works took place in the Deichtorhallen in Hamburg.